Apple iPad Air review | What Hi-Fi? 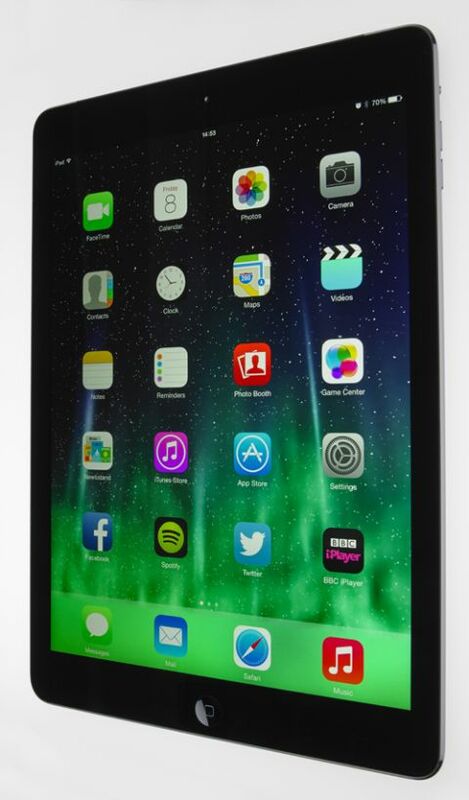 The new Apple iPad Air is a stunningly powerful and desirable tablet. Promising faster, better performance across the board – and a new, sleeker chassis – the iPad Air is shaping up to be a leaner, meaner machine than its four predecessors. The advent of the Air has, inevitably, meant death for the iPad 4. The previous generation and current Award-winner has been discontinued, with only the 16GB iPad 2 serving as a reminder of past incarnations. Hold the iPad Air in one hand and an old iPad 4 in the other and you’ll notice differences immediately. The iPad Air is 7.5mm thin, compared with the 9.7mm iPad 4. It has a slimmer bezel, too, and the wi-fi-only version weighs just 469g. The iPad 4 weighs 652g – and now feels really quite heavy and cumbersome. Build quality is impeccable. The unibody aluminium construction is as shiny (and prone to scratching) as ever, and comes in two finishes: Space Grey and Silver (no Gold version for the Air, we’re somewhat relieved to see, that's just for the iPhone 5S). The volume controls and power buttons on the right-hand edge have been given a polish, too. They’re easy to find instinctively and respond swiftly. It’s still a gorgeous and elegant object. The curved edges of the iPad 4 have been reduced to create a lighter, more rectangular and more streamlined design that’s in keeping with the daintier builds of the iPhone 5 and iPhone 5s, and the iPad Mini. It might sound like a superficial makeover, but all the tweaks add up to deliver a tablet that is much easier to hold in one hand – especially if you don’t have shovel-sized palms. As a result, you pick it up more, and you use it more. The iPad 4 is a reassuringly hefty slab of tablet – and some might still prefer that to the svelte iPad Air – but in the long run, the Air’s lighter build makes much more sense for daily use. Tapping and swiping along the screen feels different, too. Apple has reduced the thickness (well, thinness) of the glass by 17%, along with reducing the depth of various other components, in its bid to create a thinner product. The iPad’s Retina Display screen has always been a stunner, and the Air’s is even better. The 9.7in iPad Air display is crisper, with highlights and whites looking particularly clean and bright. The whites on the iPad 4 look slightly yellow-tinged in comparison. And even with both iPads on full brightness, the iPad Air is considerably brighter. It’s a more inviting screen. There’s been no change to the 2048 x 1536-pixel resolution, but it retains its punchy, sharp, and clear look, with a little more brightness and a touch more crispness to the edges. Web pages look sharper and cleaner than before – the black text looks more solid against the white background of www.whathifi.com, for instance – and images are punchy. iOS 7 looks stunning on the iPad Air, too. The tablet version is slightly different from the iPhone version (there’s no torch or calculator in the Control Centre, no Rolodex-style tab view in Safari, and you get a full-screen world-clock display). The App Store has been Apple’s strongest card to play against Google, and the optimised-for-iPad apps – from Spotify to games such as Device 6 and The Room – all look gorgeous on the large-screen tablet. There isn't any change to the overall rich but still natural colour balance during video, either. Detail hasn’t increased, but the added crispness makes it a cleaner, and even more exciting screen to watch. Play a 720p iTunes download of the BBC’s Peaky Blinders and the dusty yet stylishly stark scenery is full of texture and crisp detail. We’re also happy that the improved white tones haven’t affected the lush, deep blacks that Apple is so good at delivering. The iPad Air video performance shows plenty of subtlety in the shadows of the bleak town setting, and you can easily discern textures and shading on dark fabric. There’s a gratifyingly wide viewing angle, too – which bodes well for sharing YouTube cat videos. Switch to a lower-resolution mp4 file of space-Western series Firefly, and the show’s characteristically rich brown and red colour palette looks lush and warm, while highlights and glowing lights are punchier and bright against dark interiors. Switch to MasterChef: The Professionals in HD on BBC iPlayer, and the picture’s sharpness, clarity and subtlety are stunning. The sound quality of Apple’s smartphones and tablets leads the way, and the iPad Air is no different, sounding exciting and refined. Like the picture, the sound is crisper and cleaner than on older iPads. The richness and warmth of the iPad 4 (which was lovely to hear) has been scrubbed a touch cleaner for a more open, dynamic and precise sound. The leading edges of notes are more definite, rhythms sound snappy and accurate, and there’s a bigger sense of space. Voices are wonderfully expressive and direct, too. You’ll definitely need a decent pair of headphones to take advantage of the Air’s excellent sound quality with music, movies and games. We’d recommend the Award-winning AKG K451s (£50) or check out our list of the best headphones to buy in 2013. The AKGs are a great portable pair, and their fast and lively character sits perfectly with the Air’s punchy sound. Those with a bigger budget should consider the Award-winning Philips M1s (£125), which sound even better. If you want to stream via Bluetooth, wi-fi or AirPlay to a wireless speaker, the premium-quality Audio Pro Allroom Air One (£500) will do the Air’s sonic talents justice. Apple has, happily, taken notice of its (previously poor) speaker placement, too. The iPad 4’s speaker at the bottom left edge meant it would get immediately muffled when propped up on its side or held in one hand. The Air has a grille either side of the Lightning port, in similar fashion to the iPhone 5s. It doesn’t quite deliver stereo sound as well as the Google Nexus 7 (which has a speaker at each end and gives a wider soundfield in landscape mode), but it is a cleaner, louder, more obstruction-free sound than the iPad 4. It’s more solid and satisfying than before too, and means you can, should you wish, comfortably listen to music or radio shows straight from the iPad Air. The lighter build and streamlined design is only half the story with the iPad Air. At its heart beats the speedy 64-bit A7 processor that’s also found in the new iPhone 5s. But that alone doesn’t make it twice as fast as the iPad 4’s A6X chip. An additional M7 co-processor acts as the A7 chip’s sidekick, and takes care of any motion-related data collection and processing, such as those used by fitness and sleep-monitoring apps. Wi-fi has been given a boost, too. The iPad Air is fitted with two antennae with MIMO (Multiple In Multiple Out) technology, which promises to load web pages twice as fast as previous generations. Web pages and BBC iPlayer videos loaded a couple of seconds quicker on the Air than on the iPad 4, even in our crowded office network. It only takes switching back to the iPad 4 to realise just how powerful the A7 processor is, and how brilliant the iPad Air is to use. The A7/M7 multitasking approach leads to a noticeably zippier experience on the iPad Air. Simply swiping across the Air’s screen feels swifter and more responsive. Apps open and close with no hint of stutters or judders, flipping between multiple tabs on Safari is seamless, and iOS 7’s numerous animations are much smoother than on the iPad 4. Whether it's just checking emails and Twitter, playing iPad-specific apps downloaded from the App Store, or watching videos in bed or on the train, we find ourselves using the iPad Air more – and more comfortably. It doesn't strain your arms as the iPad 4 would after a few minutes of holding it up, and it's light enough to be almost as portable as the iPad Mini and Google Nexus 7. We did have a slight worry about our thumbs now resting on the screen because of the slimmer bezel at the sides, but Apple seems to have thought about the possibility of accidental link-clickage. The iPad Air’s screen is coated with the iPad Mini’s ‘thumb-rejection’ technology, which detects when thumbs are simply resting on the screen. This seemed to work when looking at www.whathifi.com – we didn’t click any of the links in the left-hand sidebar by mistake. It's a little bit hit-and-miss at other times, though; we found ourselves being a little more careful about our thumbs when using the Air in portrait mode. The bezel on the top and bottom edges hasn’t been reduced, though, so there are no such issues when watching videos in landscape mode. The A7/M7 partnership also explains how the claimed battery life stays at the same 10 hours as the iPad 4, despite the Air having a smaller battery than iPad 3 and iPad 4 (39.2 watt/hour compared to 42.5Wh). We found that the Air lasted a full day with us using it to the max: watching stored videos, catching up with TV shows on BBCiPlayer, playing Spotify, multiple app use, and web browsing using wi-fi. It beat the iPad 4 (same functions, same wi-fi) by a couple of percentages. It’s not much, but we’re grateful for any improvements in longevity. We didn’t feel inclined to reach for the charger until the next day, although juicing the iPad Air up to the full 100 per cent still takes ages. A full night’s charge should do it. We’ll be honest: using a large tablet to take photos is rather awkward. Using a smartphone is much quicker, more intuitive, and the camera is usually better. We suspect Apple thinks the same, as it hasn’t adopted the iPhone 5s’ excellent True Tone flash, nor has it enlarged its 5MP iSight camera to the iPhone’s 8MP. In specs, it’s identical to the iPad 4, but is the iPad Air camera performance the same? The front-facing 1.2MP camera is considerably brighter and crisper, which is great for Skype video calls. We found the iPad Air’s rear-facing 5MP camera to have a crisper, brighter and more focused image on the whole. It’s a cooler colour palette than before, which we think takes a bit too much away from the rich, natural hues of the iPad 4. Outside our Teddington office and next to the river in natural daylight, the iPad Air (on the right) and iPad 4 (on the left) took largely similar pictures. The Air is just a touch sharper and brighter. Taken indoors, that sharper image is even more obvious. The edges of the glass are more pronounced, the reflections are shinier, and it’s a cleaner, more focused image, too. However, we found ourselves preferring the iPad 4’s ability to reproduce natural colour better (below right). Picture quality drops in low light. The Air’s camera doesn’t quite capture the colour of the wooden bookshelf, blacks levels aren’t as subtle, and takes the cooler palette just a little too far. It loses the rich hues of the iPad 4’s camera snaps a bit too much for our liking, despite a sharper image. The iPad Air only comes with the lightning cable and charger, the SIM Eject Tool pin, and a quick-start guide in the box. The pre-installed apps, however, are another matter. You get Apple's entire iWork and iLife suite of apps… free. For the first time, Pages, Keynote and Numbers (all previously £6.99), and iMovie, iPhoto and GarageBand (all £2.99 previously) are free to download. That saves you about £30 in apps, whether you use Pages (which has been given a fresher interface and more editing tools) and iPhoto to edit or not. It's a pretty good deal, considering the price for a shiny new Air has stayed the same as the iPad 4. The 16GB wi-fi only model costs £400. But we find that's too sparse for the space-eating apps and videos that you'll want to fill the Air with. It’s worth keeping that in mind, as there’s no microSD slot for expandable storage. However, Apple does offer larger-capacity models than its rivals. Moving up the storage scale, £480 buys you 32GB, 64GB costs £560 and the 128GB model will set you back £640. The Air is also available in 3G and 4G cellular versions. These cost an extra £100 over their wi-fi only counterparts. We admit we got quite giddy and spoilt with our 128GB review model – but that costs a whopping £740. Make sure you insure it. The 10in tablet market is sparsely populated, with Apple having a comfortable dominance over similar-sized tablets from the likes of Samsung and Google. It’s biggest rival, then, is the iPad Mini. Even lighter, smaller and more portable, and now with a Retina Display, the Mini is fierce competition for the iPad Air. It isn’t far off in terms of pricing, either, with the 16GB entry-level model costing £80 less at £320. The gap increases by £100 once you get to the 128GB model, though. We’ll see how things shape-up once we review the new iPad Mini, but we think it will take quite a lot to beat the iPad Air. We have said this before, but it really is the best Apple iPad yet. For those wanting a big tablet, this is it. The design tweaks, the increased power and improvements to video and sound quality all add up to a stunning tablet that’s truly exciting to use.